Bikers and beers. In most parts of the country, those two elements may be reasons to move elsewhere. But in the foothills of Colorado's Front Range, bikers mean cyclists: Fort Collins has 29 miles of well-used trails. As for beers, this town has become a high-end microbrew mecca. New Belgium Brewery (maker of Fat Tire) is based in this entrepreneurial town, and competitors are moving in. People here aren't slackers either. 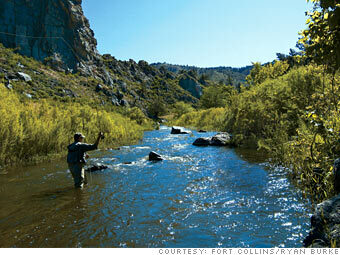 Bolstered by Colorado State University, which employs 7,000, "the Fort" is a center of economic activity. Hewlett-Packard, the city's second-largest employer, announced worldwide layoffs in June, but they won't affect Fort Collins. In fact, the company is adding jobs here. Is Fort Collins a great town, or what? Itching to move to one of these top 10 cities? You might score a real-estate bargain, too.